Bricktie was developed to overcome the problems associated with lifting heavy blocks in the construction of 215 mm and greater thickness walls. The use of Bricktie allows the construction of collar-jointed walls – made up from two thinner blocks in accordance with BS 5628-1. By tying the two masonry leaves together, the wall may be designed as though it were solid construction. 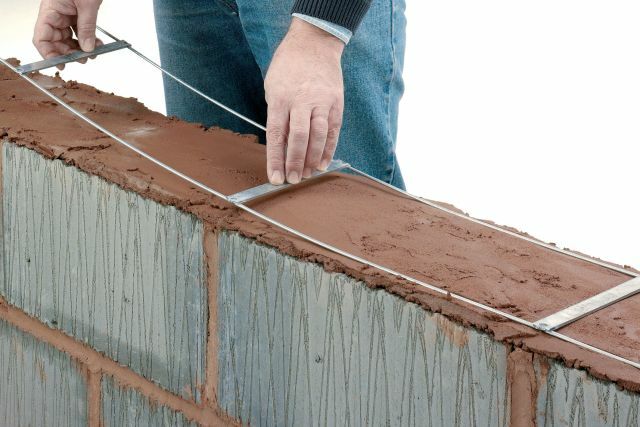 Bricktie provides an effective and time-saving solution to most wall combinations and consists of a 20 x 3 mm flat tie welded to two longitudinal flattened reinforcing wires. Bricktie is available in widths to suit any required wall make up, although the most common form is a 175 mm wide Bricktie to suit a 215 mm collar-jointed wall constructed from two leaves of 100 mm. In addition, the longitudinal wires can be utilized for either structural strength or to extend the distances between movement joints. Bricktie complies fully with the requirements of the Reinforced Masonry Design Codes, BS 5628-2. and Eurocode EC6, being manufactured in accordance with BS EN 845. Brickforce®, Stainless steel – External walls. Brickforce®, Galvanized steel wire, zinc coated – Internal walls. Bricktie is supplied in 2.70 m long strips and supplied in packs. Insert code SCF or GCF, plus wire diameter and product width in mm, e.g. SCF40W175 or GCF35W175. The product information below is from the NBS Plus library of product clauses offered in NBS specification products. It has been created by NBS for Bekaert Bradford UK Limited. Each product clause is authored in NBS format and is intended for inclusion in project specifications. Please note that NBS product guidance is not a replacement for the manufacturer's literature and it is recommended that Bekaert Bradford UK Limited be consulted before specifying.